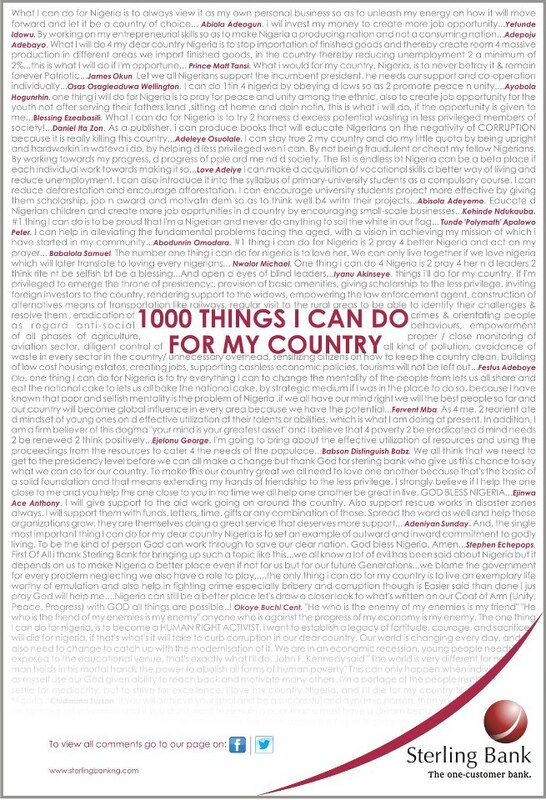 Sterling Bank recently awarded five winners of its Facebook contest titled ‘1000 Things I Can Do For My Country’ that promotes patriotism amongst Nigerians. The winners of the contest are: Breezy Jumbo, Akinyere Uko, Timothy China, Ajayi Olabambo and Abanbola Olaniposi. According to Shina Atilola, Group Head of Corporate Development of Sterling Bank said those who want to join should to answer the question, “1000 Things I Can Do For My Country” using social media. Those who participated and posted their answers responded on the things they will do to improve the image of Nigeria domestically and among international observers. After all the responses and comments were received, they were then posted on Facebook for the public to vote on the best one. The comments with the highest number of Facebook ‘likes’ received Samsung and Blackberry phones as prizes while the first 100 entries received movie tickets at Silverbird Galleria. The contest began in the last week of September and then ran for 17 days.